This time, a small project that requires no own layout or circuit design - so perfect in between for something to tinkering and programming. Inspired by the web sites have built a pong-clock, the idea came to build a small DCF77 clock with multiple modes - even Pong - supported and uses an active display for easy reading in the dark. Since LCD displays always produce a shimmer around the display with the backlight, the choice fell on an OLED display with 128 x 64 pixels. 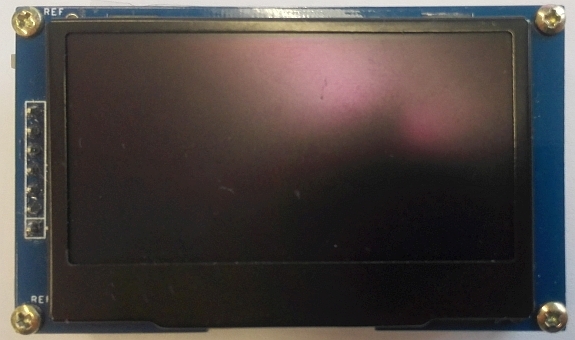 Such displays can be found online with 2.42" at reasonable prices. 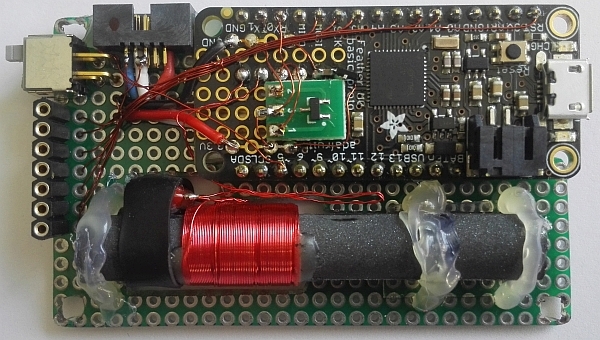 As controller, a Adafruit Feather M0 Basic with the Atmel SAMD21 Cortex-M0 and a JST-PH connector for a LiPo battery is used. Thus, the clock can run for some time without power supply continue and the battery is automatically charged when plugged in. 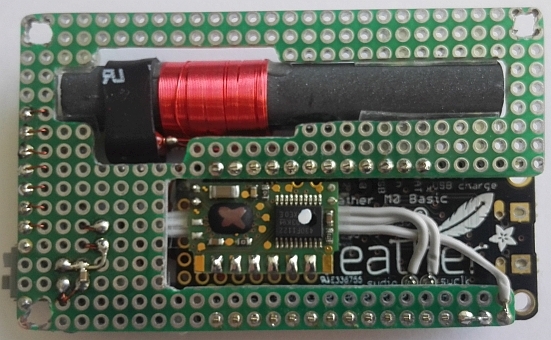 On the free surface of the Feather M0 Basic the DCF-receiver is soldered. 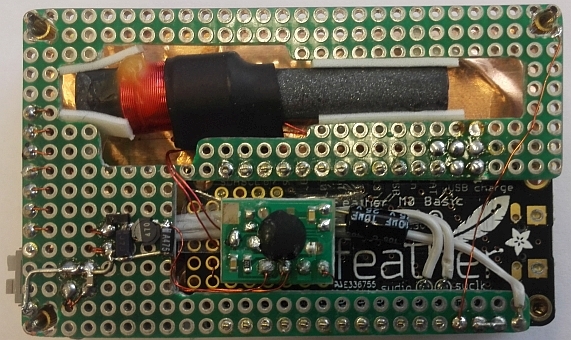 The order of the DCF77 receiver module and antenna from HKW provides on its internet store is not a problem. The relatively high price is made up for by the complete signal preprocessing. Only the full document is not sent and is not (any longer) on the side of the company to find. Some search the web at least brought out some posts and an older version. 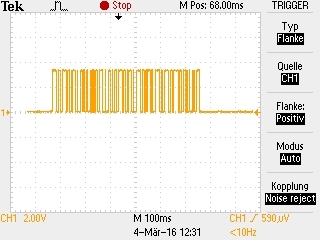 To connect the output of the HKW-receiver directly to the input of a MCU UART, the signal must be inverted. 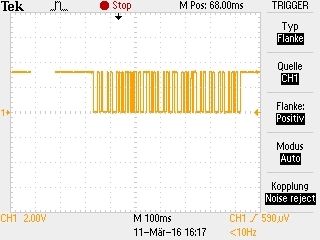 For his I have used a MOSFET transistor with a resistor. So I have implemented the following modes. The best as "analog", "pong" and "tetris" are not rewritten by me. The reference to the org. Authors are documented in the specific source code. And here is the complete source code along with the Keil-project of the DCF_OLED-clock. The icon for the DCF reception is very restrictive handled. Without the minute-mark or after error / parity-error "no sync" is set. As long as the synchronisation is valid - until successful receipt of a complete datagram - "in sync" is used. After successful receipt of a complete error-free datagram "DCF valid" is displayed. Once an error when receiving the subsequent datagram occurs, "no sync" is set again. A/D reading of the battery state of charge. No matter what I've tried (sample-num / sample-count) - the value of a real instrument never was determined even approximately.